Illinois swims against the tide a little when it comes to state income taxes. As of 2019, it's one of only eight states that uses a flat tax system rather than a progressive system where rates gradually increase as a taxpayer earns more. This leads some to think that Illinois doesn't actually have an income tax, but make no mistake—it does. People are just taxed differently here. Everyone pays the same tax rate in Illinois regardless of income. This simplified equation makes the state's tax returns much less complicated than those in most other states. 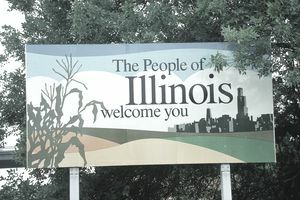 The starting point for your Illinois return is your federal adjusted gross income (AGI). You'll find your AGI on line 37 of your 2017 Federal Form 1040, on line 21 of the 2017 Form 1040A, or line 4 of the 2017 Form 1040EZ. The IRS introduced a new Form 1040 for the 2018 tax year and going forward, so your AGI now appears on line 7. There is no longer a Form 1040A or 1040EZ available after the 2017 tax year. Your AGI represents your income after adjustments are made to it, such as deductions for student loan interest you paid and IRA contributions you might have made. It doesn't take into account any itemized or standard deductions or tax credits you might be eligible for. These are subtracted from your AGI to arrive at your taxable income. Add-backs are sources of income that are not included in your federal AGI but are taxable in Illinois, such as federally-exempt interest income. Subtractions are items that are taxed federally but are not taxed in Illinois, such as retirement and Social Security income and contributions to 529 college savings plans. This savings plan provision is one reason Illinois is considered one of the best states for college savers. Illinois' Schedule M offers a full list of additions and subtractions recognized by the state. The list changes periodically, so check back each year. Itemized and standard deductions are not allowed in Illinois, which is consistent with the state's flat tax ideology of simplification and fairness. Taxpayers are allowed to claim personal exemptions, however, and available tax credits can reduce the amount of tax owed. The state allows you to claim a personal exemption of $2,000 as of the 2018 tax year. This amount is actually less than it was in previous years because legislation has removed the cost-of-living adjustment that could be trusted to increase it incrementally year by year. All residents and non-residents who receive income in the state must pay the state income tax. If you work in Illinois and live in any other state except Wisconsin, Iowa, Kentucky and Michigan, you must pay income tax to Illinois on any income you earn there. Illinois has reciprocity with those four states so residents can cross state lines to work without worrying about paying income tax to their non-resident state. The Illinois state tax rate is 4.95 percent effective July 14, 2017. It was 3.75 percent prior to this date. The property tax credit: This credit is equal to 5 percent of Illinois property tax paid on your primary residence. You must own the residence, and you can't claim this credit if your federal AGI exceeds $250,000, or $500,000 if you're married and file a joint return. The education expense credit: If your dependent child or children attend kindergarten through 12th grade at a public or nonpublic Illinois school, you might qualify for a credit of up to $750 representing a portion of the expenses you paid. Your student must be under age 21, and both of you must have been Illinois residents at the time the expenses were paid. Divorced or separated parents who are not filing a joint tax return can't both claim a credit for the same expenses, but they can split them between their returns so they can both claim the credit for some portion of the expenses incurred. This credit is limited to single taxpayers with federal AGIs of $250,000, or $500,000 if you're married and filing jointly. The earned income credit: The EIC is Illinois' only refundable tax credit. It's equal to 18 percent of the EIC amount received on your federal return. Form IL-1040, the Illinois individual income tax return, is due annually on April 15.